The promotion of — indeed the ideal of — authentic manhood is in no way demeaning toward women. 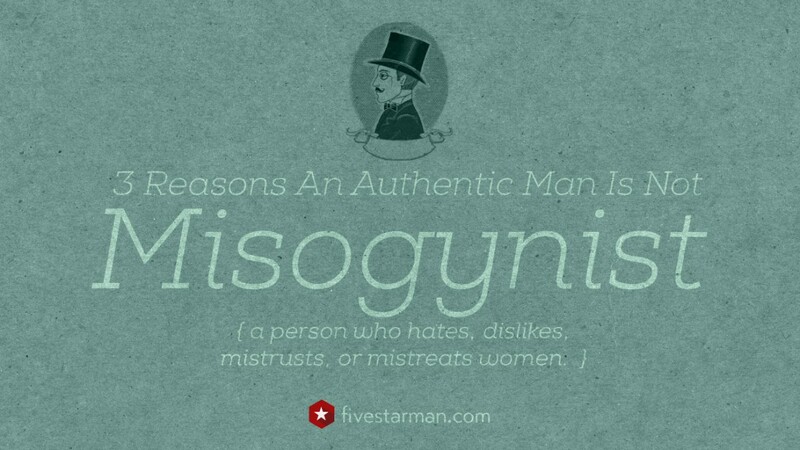 In fact, it is the antithesis of misogyny. Authentic manhood builds up, enthusiastically supports, and even sacrificially defends a woman. No woman should be treated poorly by a man, much less a man who identifies with and attains to authentic manhood — i.e., a FivestarMan. World religions have habitually used their tenets of holiness to oppress women rather than liberate them. By placing excessive demands and the liability and responsibility of purity solely upon a woman, these men show an insightful and wholly unrighteous hatred toward women. One of the deep purposes of authentic manhood is to be gallant in relationships. An authentic man shows special attention and respect toward women in an honorable way. A FivestarMan treats older women as he would his own mother. Younger women as he would his own daughter, and his peers as he would his own sister. The only woman who receives the intimacy of his eyes and the passion of his loins is his wife. In other words, a FivestarMan is extremely careful with his proximity, touch, or even eye contact with women. He is respectful in every relationship. The bar is set very high. 1. Authentic men do not objectify women. Our society has converted the amazing attractiveness of women into a perverted image of a brazen woman. You’ve seen the metamorphosis of a beautiful young woman into a copycat image of objectivity. It is demeaning to the woman and turns the men who are attracted to her into a drooling simpleton. No woman should be treated with such disdain. 2. Authentic men look for agreement not subjection. The male and female have perfectly complementary designs, not only physically but also intellectually, emotionally and spiritually. God said that it was not good for man to be alone and that he needed a helper suitable for him. The word suitable means that she is a perfect fit for him and is fashioned for him. The complement that a woman brings to authentic manhood is immeasurable. By design, the two become one. If two agree on earth about anything they ask for, it will be done for them. So, the man doesn’t make commands and demands, he leads with the conviction and clarity of their singular mission. 3. Authentic men speak kind and gentle words. So, the words of a husband literally cultivate his wife and she bears the fruit of his words. Of course, the woman has a responsibility to receive those words but her husband sows the seeds of his words for a determined harvest. When a husband says, “I love you,” or “You’re beautiful,” or “I am proud of you,” or “You make that dress look pretty,” he is speaking kind and comforting words that cleanse her from the constant barrage of negative messages that she is getting from modern culture. Her beauty radiates from the purity of her unblemished spirit. This is in stark contrast to religious rules and regulations that attempt to cover up women (sometimes literally) and add no value to holiness. A wife’s beauty and modesty are the reflection of her husband’s kind and gentle words. If a man raises his hand against a woman, he has forfeited authentic manhood. Our representation of authentic manhood is not to be like the religious zealots who hold contempt for women but rather one of Christlikeness. One who rescues her from accusers and elevates her with kind and comforting words.